Two Orcas swimming in the Lemaire Channel, in the Antarctic Peninsula. It is difficult to know for sure but the fact that they are so close to each other, and the apparent difference in size, probably means that they are a mother and her calf. Mother orcas give birth at any time of the year but most commonly in winter. I really dislike the term "killer whale": they are not more or less killers than any other apex predator. 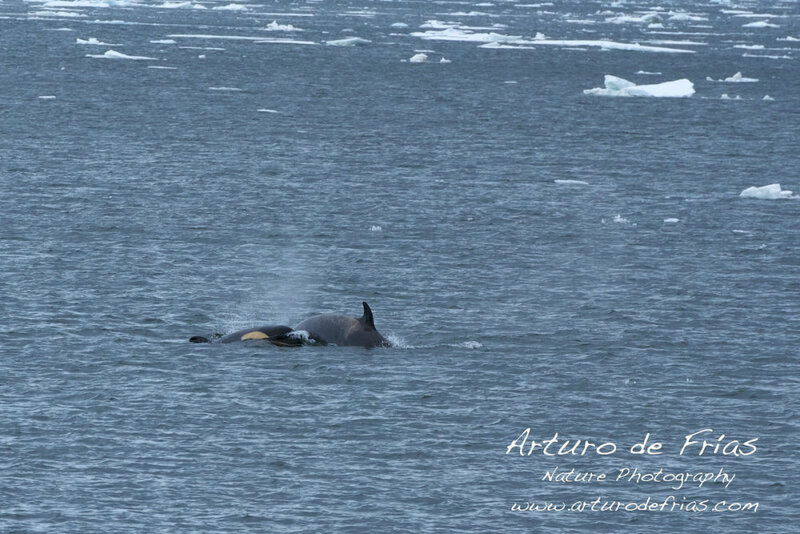 Dos Orcas nadando en el Canal Lemaire, en la Peninsula Antártica. Es difícil estar seguro pero el hecho de que están tan juntas y la aparente diferencia de tamaños parece sugerir que son una madre y su croa. Las orcas dan a luz en cualquier estación, pero lo hacen con mas frecuencia en invierno.